Engine problems? Maybe Scotty can help! Bathrobe based on Star Trek: The Original Series. Red robe features black trim, dotted golden rank braids, and the Engineering insignia. Includes a black belt and pockets to hold your tools. Is your car out in the cold having engine problems? 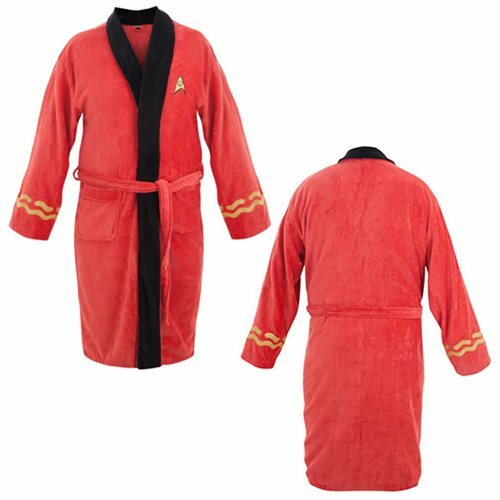 Simply throw on this Star Trek Original Series Scotty Cotton Bathrobe and if you're not able to channel Montgomery Scott's advanced engineering skills to fix your car, at least you'll be warm! With its red design, black trim, dotted golden rank braids, and Engineering insignia, you'll look a lot like a Starfleet engineer. The robe comes with a convenient black belt and pockets for your tools, measures 47-inches long from shoulder to bottom, and fits most male adults 5-feet 6-inches up to 6-feet 2-inches tall.